14-10-2011 Knowledge Clinic among Entrepreneurs featured in televised program: "Out and About in Ireland". Some of the west of Ireland’s most acclaimed and successful businesses featured on an hour long TV programme on SKY TV Thursday evening 13 October. The show entitled ‘Entrepreneurship in the West of Ireland’ features several well established companies from Mayo, including CBE in Claremorris, McHale’s Engineering in Ballinrobe and Allergan Pharmaceuticals in Westport. 13-10-2011 Knowledge Clinic Selected as Regional Finalist in the Seedcorn Competition Sponsored by Intertrade Ireland - Intertrade Ireland today announced the regional finalists in the Seedcorn Competition. The competition is based on a rigorous examination of business plans for investment potential by venture capitalists. Knowledge Clinic is one of three companies from the western region shortlisted in the high potential category for its innovative Best Patient health education system. 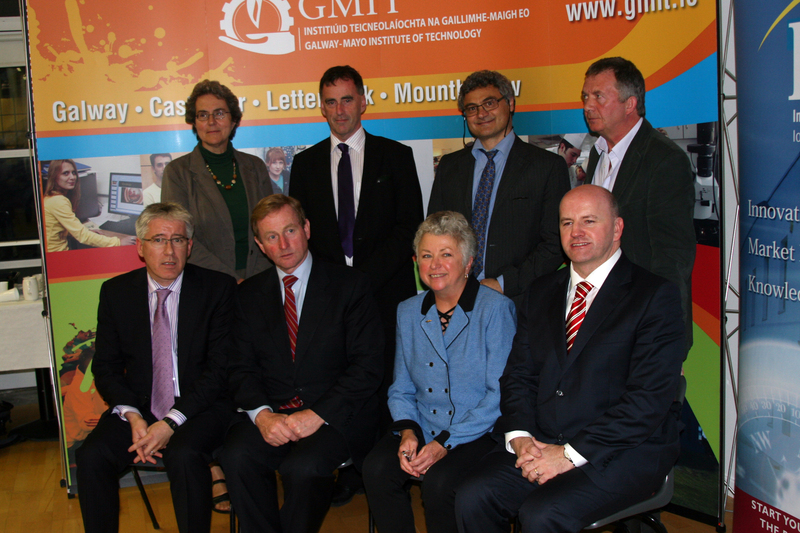 Daria Blackwell seated between An Taoiseach Enda Kenny (Ireland's Prime Minister) and presidential candidate Sean Gallagher. Spirit of Entrepreneurship evening, GMIT Castlebar, Co. Mayo.